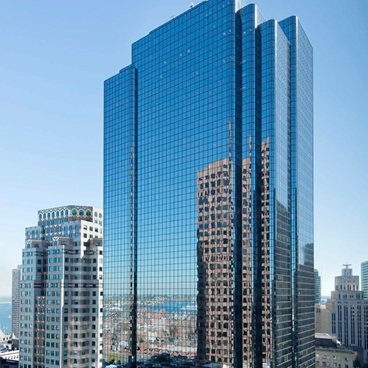 When Fiduciary Trust moved into its 175 Federal Street home 40 years ago, then President Robert Gardiner described the newly constructed tower as “the right building in the right place at the right time.” Fiduciary Trust will be embarking on a similarly important move this June. Not only does Exchange Place meet Fiduciary Trust’s 21st-century needs for space, accessibility, and comfort, but the building itself also embodies our history. 53 State Street’s granite foundation was built around 130 years ago, just a few years after Fiduciary Trust was founded in 1885. Like Fiduciary Trust, Exchange Place played an important role in Boston’s financial history, as it was once home to the Boston Stock Exchange. Similar to Fiduciary Trust — which remains committed to its historical principles of integrity and personal service, while also embracing modern advancements — Exchange Place has also transformed over time. On top of the 12-story marble-clad former Boston Stock Exchange stands a 40-story modern glass skyscraper — one of the tallest buildings in Boston’s Financial District. It is also an environmentally-friendly building, carrying the top LEED (Leadership in Engineering and Environmental Design) certification of platinum. 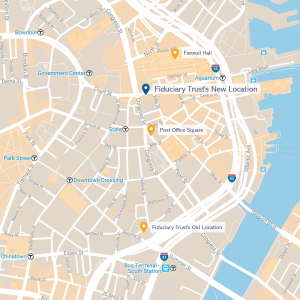 Fiduciary Trust’s floor will occupy both a section of the original Exchange Place building as well as the glass tower in this fully renovated space. We will keep you posted on our progress as our moving date approaches. We also look forward to hosting an “open house” welcoming gathering for clients and friends in the second half of the year. Note: Our P.O. Box will remain the same. If you currently have recurring bills, deposits or other communications being delivered to 175 Federal Street, please change them to be sent to our P.O. Box/mailing address noted below.